The Diplomat Radisson Blu Hotel, Residence & Spa lies near Financial Harbour and the city’s most important business and cultural destinations. Enjoy Free high-speed, wireless Internet, a bathrobe and slippers, and floor-to-ceiling-windows in one of the hotel’s spacious rooms or suites. Sample Italian, Irish or Asian cuisine at the on-site restaurants. The spa draws on the culture of Thailand to offer an array of soothing treatments, and the well-equipped meeting facilities provide an ideal venue for conferences or special events. 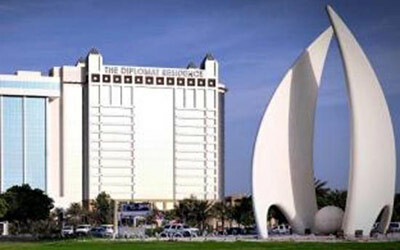 Contact The Diplomat Radisson Blu Hotel, Residence & Spa for an extraordinary stay in Bahrain.